Sawatdee Pi Mai kha! It's the Thai way of greeting Happy New Year. As we count our blessings for the year 2009, I wish you and your loved ones good tidings, good health, success and abundant blessings in the New Year 2010! Cheers for a more prosperous and abundant year! God bless us all. Red bricks are common roofing in Thailand even in its early history. 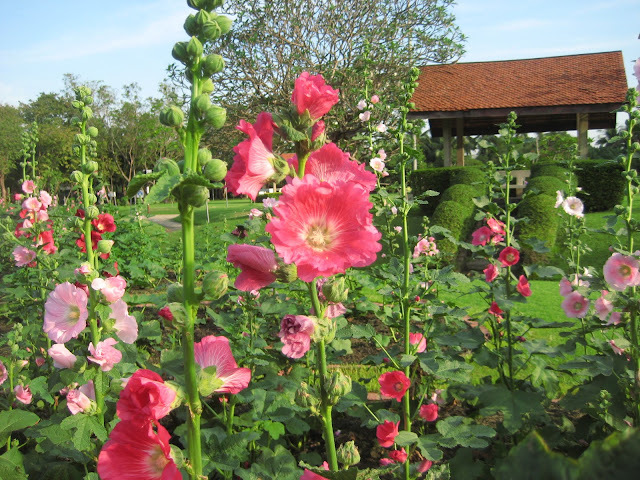 Not only are Thais known for their distinct architecture but also for their horticultural talents. Well-trimmed hedges are seen everywhere in Thailand. 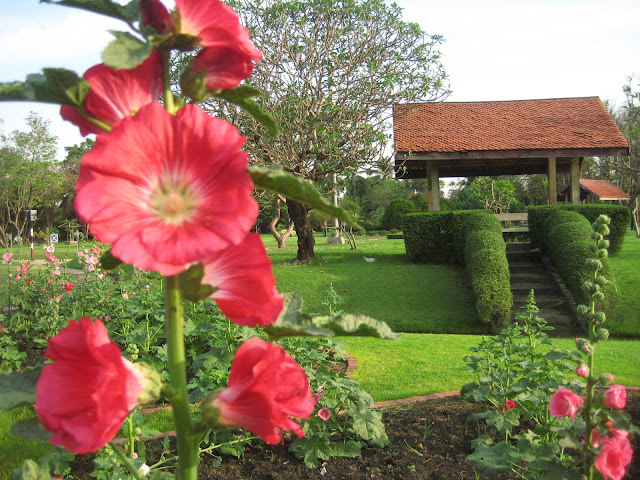 I love these flowers grown at the park in preparation for the birthday of His Majesty the King on December 5. Can anyone please tell me the name of this flower? For more Ruby Tuesday entries, please click here. A green worm enjoys feasting on the bright sunflower. My daughter took this photo. 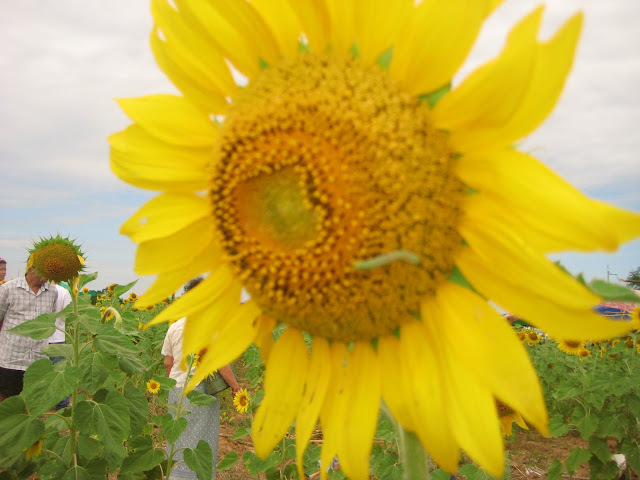 Sunflowers are so bright that when they are planted in a vast farm, the place glows with warmth. 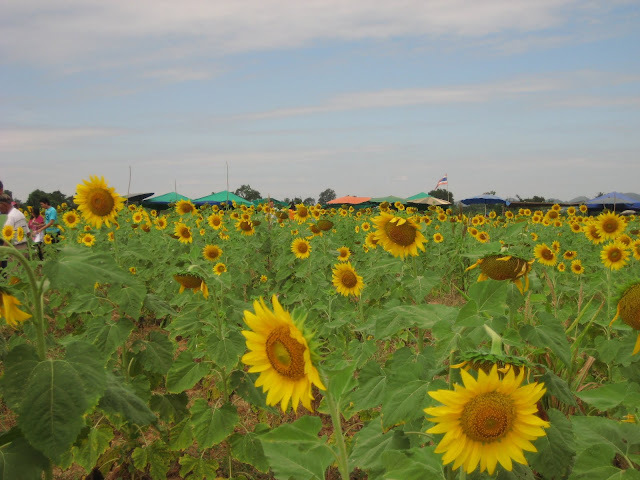 Farmers in Saraburi, two-hour ride from Bangkok, grow acres of sunflower gardens and they are in full bloom in November until mid-December. So last weekend when the kids arrived, we headed there with friends right away to catch up with the blooms that would soon wither. 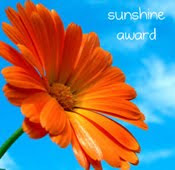 These flowers wonderfully follow the sun's direction. 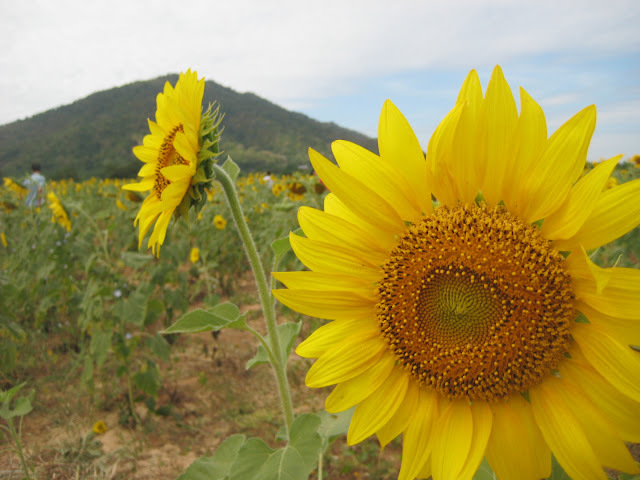 This time we want to take the nice view of the mountains, not the faces of the sunflowers as they just all together keep following the sun. Even 7-month old Jako enjoys the trip. For more MYM entries, click here. When I and my family were watching on TV the flashbacks of the tsunami this morning at a guesthouse for a weekend treat for our kids, I could not believe what I heard. That unmonitored tsunami took away over 250,000 lives in 14 countries in just a matter of one hour. And I'm one of those lucky souls who escaped that disaster as I was on an island in the western part of Phuket on that very day the big waves struck with fury. It's good we were brought by our guide to the wrong island. But I would say that it was God's hand leading us because there were islands covering the island where we were so the impact of the big waves was not that strong compared to that in Patong where most of our guys wanted to go. Thanks God our boatman was able to bring us back to the pier before the third big wave hit. I can still freshly remember how Bert, the tallest guy in our team, hurled us ladies into the boat as we could no longer reach it after the second wave. The first wave was only about 2 meters high. Then all of a sudden, the water came down like it was swallowed by the sands of the sea without us realizing it was just gaining momentum for its next stronger blows. Before the second blow, I was already terrified with panic and didn't know what to do. I ran uphill but shouting to my colleagues that it's a tidal wave. Thanks to my husband who is very knowledgeable about science. He was yet in the Philippines that time and he happened to be exchanging SMS with me while the rest of our colleagues were swimming except my friend who I was enjoying taking photos with. Dear hubby bade us to leave the place quickly. And so we did to save our lives. When I was thrown into the boat, I got hurt but I didn't mind at all. What was racing in my mind was to secure ourselves from the terror of the upcoming bigger waves. Sad to say, both our boats didn't have any life vest at all and we noticed the mangroves and the rocks we enjoyed taking pictures earlier were now all out of sight. The floating restaurants close to the pier were no longer in their place. They were all swept away. Many seaside dwellers were carrying some of their stuffs on their head and their back as they tried to flee away from the coming waves. We could feel the panic and hear the cries of the women and children but some of us were also crying. I was praying really hard as I was thinking of my two precious kids who are still dependent on me. I didn't go to Phuket only for sight-seeing. I went there with a noble purpose to sing Christmas carols at the hotels and resorts as organized by our church there and our proceeds would go to the orphanage for their educational fund. 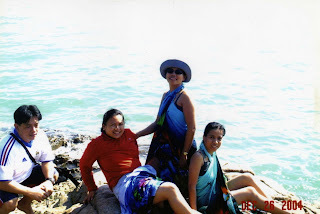 Going out to the sea on that day was just a treat for us by our hosts. It was even out of the plan. But the One who is greater than us knows what lies ahead of us. As my daughter sings, "I know He holds the future and I know He holds my hands." We're enjoying taking photos here just before the first wave came up. My friend asked me to take a photo of her just a few seconds before the first wave slapped the seashore where we were. Some of my friends' clothes and bags they hanged on this tree with their cellphone, camera, passport, money, etc. in them got wet. They had to chase or find them elsewhere. We were more concerned of saving ourselves than those little earthly possessions though. And thanks God we all survived the wrath of the sea on that fateful day of December 26, 2004. A detailed story was posted by my friend now based in the UK. 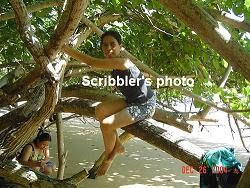 She's at the center in the photo above, the rightmost in the second and the one posing on the tree on the last. 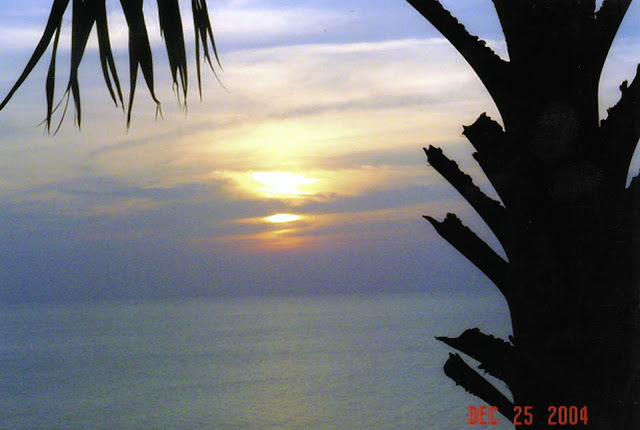 I love viewing the sunset at Cape Promthep, a tourist attraction in Phuket. But take a look at the date of this photo. 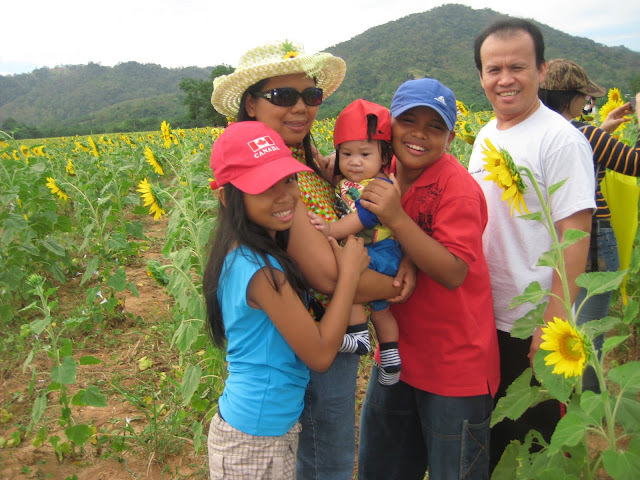 It was taken on Christmas Day of 2004, just a day before the tsunami that claimed a big number of lives hit Thailand and its neighboring countries. Watch out for my post tonight on my personal experience how we escaped death from this catastrophe. It's not only in blogging that meme is common. In Thailand, there's a color-coding everyday. If you go to the parks around Thailand everyday, you will notice this well-observed color codes. On Monday, you will see groups of people wearing yellow. For example, this group of senior citizens doing yoga under the palm trees wear their daily uniforms so on a Monday, you will see them in yellow. Even many joggers also wear yellow every Monday. And so as these aerobics enthusiasts.